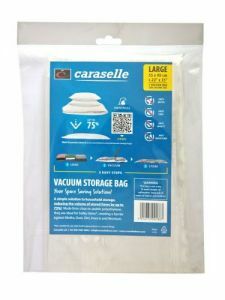 One Standard Size Vacuum Bag for Reducing the Bulk of Hanging Clothes by up to 75% and keeps moths out. If you can't make your wardobe larger, then you can make your stuff smaller! Introducing a wonderful way to store your jackets, shirts, coats, dresses etc. 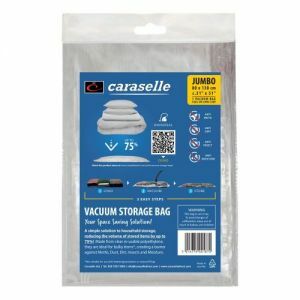 The Standard Size Hanging Vacuum Organiser compresses your clothes safely inside a special bag which has a seal and a valve into which you place your vacuum hose to extract the air from the bag. This protects your clothes from dust, dirt, moisture, moths and insects (The clothes should be clean before sealing the bag). It can be wiped clean inside and out, and can be used for many years (although it is recommended that stored items are removed every 6 months for airing). When the bag is opened, air immediately circulates through the item and restores it to its former plumpness. Gain up to 3 times more storage space. The size of the standard bag is 105 x 70cm approximately and it takes up to 5kg in weight of clothes). The standard size is suitable for jackets, suits and tops whereas the Large bag is suitable for longer items such as dresses, coats and long jackets. The bag creates up to three times more hanging space on crowded wardrobe rails and cupboards. Please bear in mind that the bags are not suitable for leather, fur or silk material, and they should not be used with feather and down filled items or perishable foods. They should be stored away from heat sources such as radiators and water tanks or airing cupboards. When hanging the bag, it would be best to hang it not with a metal hooked hanger but with a plastic hanger (which you can find under 'clothes hangers' if you do not have any at home). Next, put the clothes in the bag, attach the hanger hooks onto the large hook which comes with the bag. Use the special glider to seal the bag. Now unscrew the hanger from the valve. Place the hose from the vacuum cleaner over the valve. 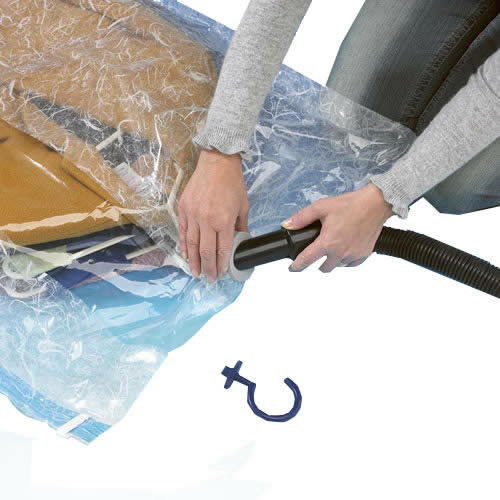 Switch on the vacuum cleaner to extract the air from the bag. The bag will compress in seconds. Replace the main hanger into the valve and now you can hang your clothes up in your wardrobe, or on a clothes rail. 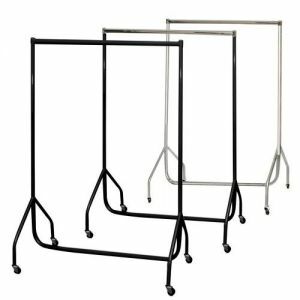 For your convenience we now stock a sturdy chrome 3ft rail and 6ft rail.